It’s called the Apple Watch, it looks like a luxurious synthesis of technology and traditional timepiece craftsmanship, and it uses a “digital crown” to navigate through lists and zoom in on data. Apple finally announced its long-awaited smartwatch on Tuesday, and, boom, just like that, the center of gravity of the shaky wearables market has shifted in a seismic reset. No, not because the watch looks that revolutionary. It’s because this is an Apple smartwatch. And for better or worse, this is the new wearable’s most important feature. The new Apple “this changes everything” device starts at $350, and will be available early next year. But here’s the kicker for potential fence sitters: Apple Watch supports the new Apple Pay system, so you can quickly purchase items from retailers ranging from Bloomingdales to Staples with a flick of your wrist. Apple Watch will come in three different models—from a baseline version to an ultra-luxe 18K gold edition—and six different bands will allow a wide degree of personal customization. “Taptic” feedback puts pressure on your wrist for iPhone notifications, and can even send signals to turn left or right in the watch’s navigation app. And, yes, this gadget requires an iPhone to work. In many ways, the Apple Watch feature set looks like it was borrowed from other smartwatch companies. Dig: The gadget tracks your steps and heart rate. It displays smartphone notifications. But Apple’s message is that Apple Watch does all these things better than the competition. And with its perfectly contoured edges, luxury materials, and nifty new UI, it’s got all the visual trappings of another “God device” from Apple. That’s a potentially transcendent advantage that could send competing wearable-tech manufacturers back to their drafting tables. Tim Cook proclaimed Apple Watch will “redefine what people expect from its category” and that the wearable is the “next chapter in Apple’s story.” To help achieve such lofty goals, the Apple Watch doesn’t ditch third-party apps—which are always so difficult to implement on wearables—but instead reimagines the smartwatch UI. The key is a new “Digital Crown” that’s used to navigate the teeny-tiny visual elements on the curved, sapphire display. The new crown translates rotary movement into digital data. But that’s just tech speak for a new navigation scheme that might solve the problem of swiping through icons on a necessarily minuscule display. The crown can be used to zoom in on interface elements and scroll through content—actions that would otherwise require finger gestures in a less advanced UI. The Apple Watch will come in two case sizes (38mm and 48mm heights), but Apple didn’t mention specifics about display dimensions or resolution, through we know the display is a flexible Retina display underneath a single crystal of sapphire. Regardless, anyone who’s ever used a smartwatch knows new navigation paradigms are welcome. Apple’s grand reveal was relatively light on details, and perhaps the Apple Watch’s most killer feature—Apple Pay support—was tacked on at the very end of the event, as if a last-minute afterthought. There were no details on internal specs, but we learned this wearable doesn’t include a camera, as its main photo feature is a scheme that turns your watchface into a slideshow for your iPhone photos. That said, Apple did riff at length about industrial design, and highlighted some built-in software features and third-party apps. Siri voice dictation will let you send iMessages to friends (among other common Siri tricks). There’s also a Digital Touch feature that lets you create something of a walkie-talkie-like connection with your pals. It's Apple’s new method for sending customized emoji and quick little finger doodles composed with digital ink. And—awwww—with Digital Touch you can even send a visual representation of your heartbeat to loved ones. Ready or not, her come third-party apps! Health and fitness features consumed a large portion of Apple’s Watch presentation, but Apple never really delved into the accuracy of its sensor technology. This is a critical area to watch, as activity-tracking features are so unreliable in competing smartwatches. 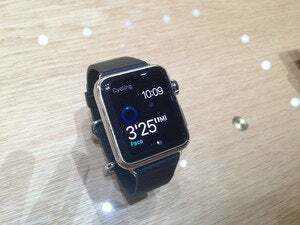 Nevertheless, Apple Watch includes a heart rate sensor and accelerometer onboard, and handshakes with the iPhone’s GPS to track and reveal various activity metrics. 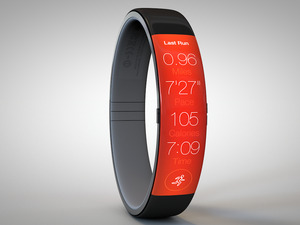 A Move ring displays your daily calorie burn. An Exercise ring tells you how active you’ve been. And a Stand ring reports the embarrassment of your sedentary lifestyle. Once you meet your daily goals for each ring, you earn an achievement, and the ring goes away. There’s also a separate workout app that reveals how far, how fast, and how long you’ve been exercising. If you’re already a fan of activity-tracking wearables, you know none of these features are revolutionary at face value. But if Apple can deliver a software interface that people love, it will solve an elusive user-experience puzzle. The upcoming BMW app will help you locate your parking space, and even report charge levels on your electric motor. In addition to all the built-in goodies, a new WatchKit SDK will enable third-party developers to enrich Apple Watch beyond the standard notifications that already appear in other iOS devices. An American Airlines app will provide you with a richly visual travel itinerary, and a Starwood Hotels app will let you use iWatch to open your room door at W hotels. A Pinterest app will provide walking directions for pinned locations. A Honeywell app will provide thermostat control on your wrist. 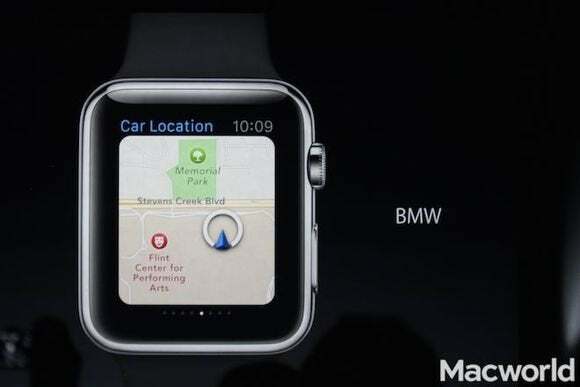 And a BMW app will help you find where you parked your car. It also sounds magical. But now we wait to see how the new Digital Crown simplifies app navigation. Wearable tech is exceedingly personal, and it’s almost impossible to deliver a single industrial design that suits everyone. 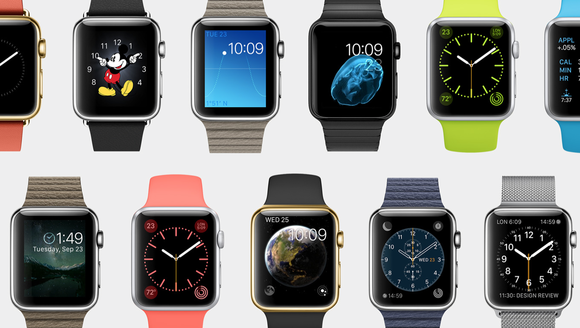 So Apple didn’t just double down on design with two different watch sizes (one for boys, one for girls, obviously). It’s also going to release three separate luxury tiers, along with six different watch bands. Even cooler: A new strapping mechanism lets you changes bands at will, and there’s no ugly charging port on the case. Instead, Apple Watch uses a magnetic charging attachment similar to MagSafe. The basic Apple Watch (we’ll assume this is the $350 model—and, ouch, that’s expensive) comes in either standard or black stainless steel. 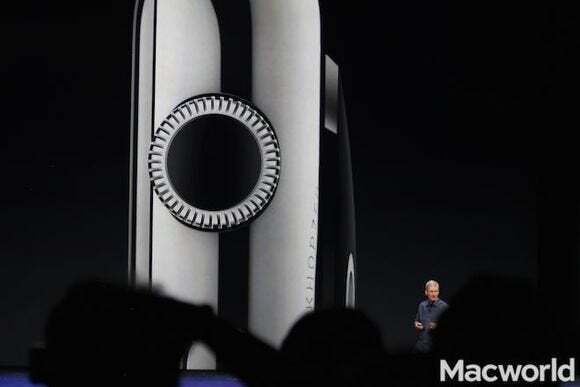 Then there’s Apple Watch Sport, which is ruggedized with an anodized aluminum case and strengthened Ion-X glass. This model comes with flashy, colorful bands. Finally, we have the Apple Watch Edition line, which is surely being targeted at all the fashion bloggers who attended the Apple event. It has an 18K gold case in either yellow or rose. A variety of bands service these models in different combinations. There’s a steely Link Bracelet for Donald Trump, a technicolor Sport Band for Shaun White, and an ultra-femme Milanese Loop for Diane Von Furstenberg—who probably feels silly now for aligning with Google Glass. A look and feel and emotion for everyone. Will all this aesthetic variety be enough to convert mainstream normal people to smartwatches once and for all? Well, the focus on design helps. 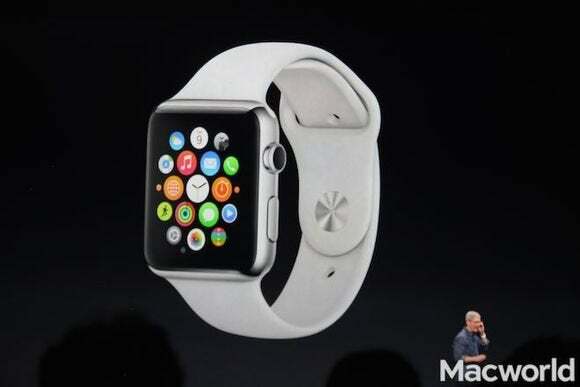 But Apple hasn’t necessarily reinvented the wheel—or even the watch crown—with the features it revealed Tuesday. It appears the Apple Watch is still mainly a wearable for quick personal communication, activity-tracking and smartphone notifications. 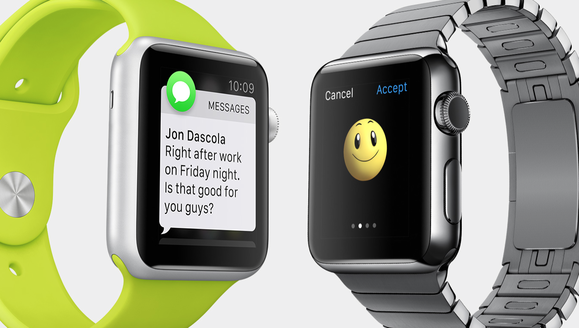 Of course, Apple Pay looks great, and could push Apple Watch to mainstream relevance. But this feature and the rest of Apple’s tricks will need to be dead-frictionless to use if Apple Watch is to be a winner.